The project proposes to take a pragmatic approach to the "last mile" issue, by studying each technological solution relatively to local socio-economic conditions and to specific constraints and costs (like power supply or international Internet connectivity). The objective is to define a set of optimal technology/context mixes, by focusing on a limited – yet representative – number of sub-Saharan African countries. Africa as a whole is characterized by a very low penetration rate of fixed networks (e.g. 0.7% in Senegal, 3% in Cameroon). By contrast, a significant and rising part of the population owns a mobile phone: 25% on average. Both the rurality of the population and its insolvency acts as a brake upon prospective deployment of fixed infrastructures taking into account the huge investments necessary to install wired solutions. 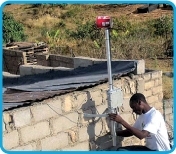 While satellite-based access solutions (VSAT) are too expensive to be deployed widely, a growing set of alternative technologies have emerged and could be used to serve the local loop: WiFi, WiMax, CDMA, HSPDA… These technologies raise hope for ambitious broadband access roll-outs through contained capital expenditure. In first analysis, none of the candidate technologies is likely to be in a position to fit all situations. What might derive from intended investigations are certain technological choices (some of them possibly of a hybrid nature) adapted to given market profiles. At any rate, the quality of interactions with "field" actors will be a key success factor for the project, as technological recommendations will be highly contingent upon local contextual factors. Thus the proposed modus operandi consists in conducting an exhaustive in-lab analysis of each technology and then evaluating its supposed validity via interactions with local actors and/or via field tests. Production of a state-of-the-art study with the aim of thoroughly analyzing the relevant technologies, identifying key players in the domain (manufacturers, service providers, carriers) and potential EU stakeholders to be involved in future initiatives. Organization of a community building activity with local actors in order to conduct in-situ tests and collect feedback from the field. This workstream will culminate in the organization of an international workshop on wireless access and infrastructure. Construction of a roadmap based on inputs gathered in stages 1 and 2, with a view to defining key appropriate initiatives to be undertaken at EU level. The partner in charge of this work package is ORANGE LABS.